ERECTED BY J.F.ARTHUR ESQ. M.D. The earliest parish record of an ‘Arthur‘ in New Cumnock is the 1735 baptism record of James Arthur, son of James Arthur and Mary Ranken at Benston. This family is very likley to be descendants of William Arthur (born c. 1760) who married Margaret Fergus (Forgy) who had five children baptised in New Cumnock in the period 1779-1805 including eldest son James who would later farm Benston whilst his second son David farmed at nearby Wellhill. James Arthur farmed the lands at Benston where he and his wife Jean Lennox raised a large family of seven sons and three daughters. Son Alexander later took over the farm, while his youngest son Hugh, emigrated to Australia with his wife Wilhelmina Houston of Garlcaugh, where they too raised a large family. Children: John Findlay (b.1807), William (b.1809), Margaret (b.1811), David Findlay (b.1813) and James (b.1816). David worked the neighbouring farm of Wellhill. He and his wife Jane Findlay had one daughter and four sons, although their youngest son James died in infancy. Third born son David Findlay Arthur was also a graduate of Glasgow University where he studied for the ministry. When the Disruption of 1843 saw 450 ministers (including New Cumnock’s minister) split from the Church of Scotland to form the Free Church of Scotland the Marquis of Bute, as patron of the church (he was also the proprietor of Benston and Wellhill), offered Rev. David Arthur the vacant position at New Cumnock. 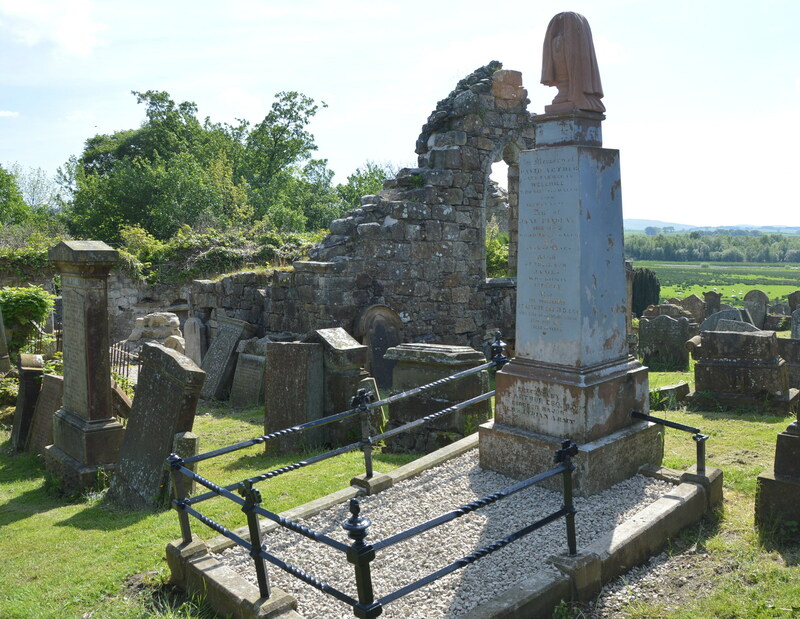 He refused the offer and instead became the first minister of the Free Church at Stewarton (John Knox Church) and later at Free Church in Banchory-Devenick, Kincardineshire. Daughter Margaret Arthur married William McTurk, farmer and proprietor of Polquhirter farm and together they had seven children. Their family lair lies against the north side of the Auld Kirk ruins. Second born son, William Arthur entered into partnership with his father in running Wellhill. William Arthur was born on 2nd May 1809 at Crook cottage on the lands of Wellhill. His elder brother John had also been born at Crook , whilst his younger siblings were all born at Wellhill. William married Elizabeth Houston, daughter of John Houston of Garclaugh. Her sister Wilhemina married William’s cousin Hugh Arthur. (John Houston’s sister, Elizabeth married John Hunter and their eldest son was William Hunter – see Discovery : William Hunter). William managed Wellhill with his father and run the farm after his father passed away, boyh his parents died in 1860 within three days of one another. Willliam and Elizabeth had no children and on their retirement they moved to a house they had built at Pathhead, called ‘Arthur’s Seat’. Elizabeth passed away in 1885 and as a widower William sought opportunities to put his wealth to good causes. He and five other men, including John Hunter (see Discovery: William Hunter) set up the annual Old Folks Party in 1889 , which would be financed by William. The first one was held in the old schoolroom of the Free Church with William Arthur as chairman. William was an active member of the Free Church and greatly concerned with the welfare of others. On his death in 1894 his estate amounted to nearly £10,000. Of this sum he desired that £1000 be invested on behalf of poor people. After payment of certain legacies three-fifths of the residue he desired to be devoted to a building fund for the Castle Free Church, and the remaining two-fifths to the furtherance of any object which might meet with the approval of the Trustees. From the interest of the £1000 referred to, forty-four of the deserving poor receive each a half-sovereign at the Whitsunday and Martinmas terms. The Arthur Trustees included retired teacher Andrew Stirling (see Discovery : Andrew Stirling) and local merchant Thomas Kirkland (see Discovery: Thomas Kirkland). In 1913, the existing Free Church was replaced with the magnificent Arthur Memorial Free Church a fitting tribute to a much loved benefactor. In 1913, the existing Free Church was replaced with the magnificent Arthur Memorial Free Church that stood proudly on the castlehill and served a loyal congregation. In the summer of 2015 after having fallen from use for many years the church named in memory of William Arthur was demolished. Within its foundation stone was found the time capsule of not only the Arthur Memorial Church but also that of original Free Church. Within the time capsule was found the William Arthur Dux Medal that were presented for many years by the Arthur Trust to school children for ‘General Excellence’.